As our exclusive video story coverage of Richmond River Lake Days continues, DigElog ROCORI brings you the professional skateboarding performance that was held at the Church Grounds. This group of skateboarders hails from the western suburbs of Minneapolis, MN. As the Friday night festivities went on, folks that came out to watch the Jolly Jammers funneled over and caught the skateboarding demonstration. These performers may be young, but they’re extremely talented. Enjoy the show and as always, stay tuned to DigElog ROCORI for more coverage from Richmond River Lake Days. 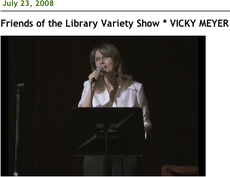 Here's another act from the "Friends of the Library Variety Show" that took place earlier this year. In this act we'll hear the lovely Karla Reichel sing a medley of songs. She is accompanied by Jeannie Schoephoerster on violin and Craig Kimmerle on piano. Sit back, relax, and enjoy. 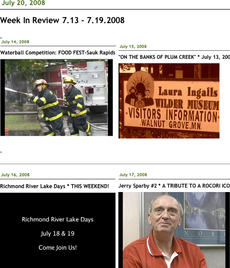 Richmond River Lake Days began on July 18, and DigElog ROCORI was there to catch all of the action. 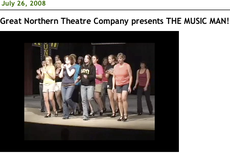 In this story you’ll see a performance by a Minnesota Band, the Jolly Jammers. You’ll also see many of the sights and sounds from Friday Night. Stay tuned to DigElog ROCORI for more coverage from Friday nights events as well as many of the other weekend festivities. 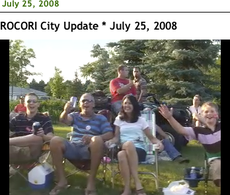 This edition of the ROCORI City Update, Larry Lahr reminds Cold Spring citizens about the “do’s and don’ts” of Hometown Pride Days garage sale signage. For those of you who missed last weeks city update, Larry discussed some of the events that are coming up next weekend (July 25 & 26th) for Hometown Pride Days. 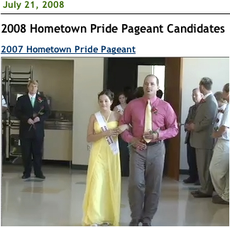 You can also see a full-length feature story on Hometown Pride Days that was sponsored by the planning committee. Rena Weber gives us a very brief update this week about the status of Rockville’s “electronic initiative.” So far so good as there have been no complaints about the council packets being shifted to online instead of paper. The other updates Rena shared are in regards to an informational meeting that will be held later this month about Rockville potentially installing wind turbines. Lastly, the city will be doing nitrate testing for residents who have their own private water wells at the end of August. For more information on the testing feel free to call city hall. 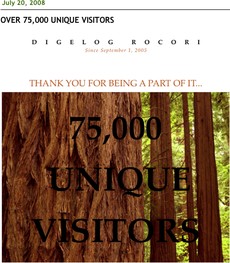 Lastly, in the Richmond update we simply want to remind everybody that DigElog ROCORI was out at the annual River Lake Days. Later next week you can see all of the events that we captured. Some of the events include musical performances, a skateboarding demonstration, the Granite City Cloggers, and of course everyones' favorite, the parade! All right folks it’s that time of year again. The ROCORI festival season started last weekend with Richmond River Lake Days, and this week Cold Spring hosts its annual get together, Hometown Pride Days. 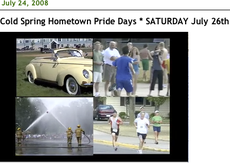 In this story you’ll hear from members of the Hometown Pride Days Planning Committee as they tell us about many of the exiting events that will be going on in downtown Cold Spring the weekend of July 25th and 26th. 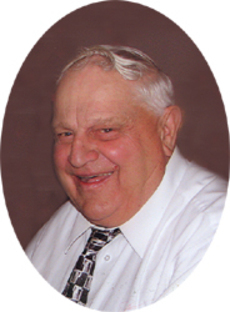 You’ll also hear from Gene Hesse, an active volunteer at the Cold Spring Legion. As always Hometown Pride Days offers a plethora of events, and theres something for everybody to enjoy so grab the friends and family, and come on out to enjoy the festivities. Here's another act from the "Friends of the Library Variety Show" that took place earlier this year. 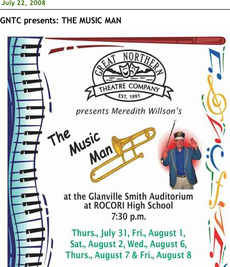 In this act we'll see multi-talented Vicki Meyer sing a medley of songs from 'Phantom of the Opera'. Vicki is accompanied by Jeannie Schoephoerster on violin and Craig Kimmerle on piano. Sit back, relax, and enjoy this lovely Andrew Lloyd Weber music.